I am late to the Nester's party, but better late than never. 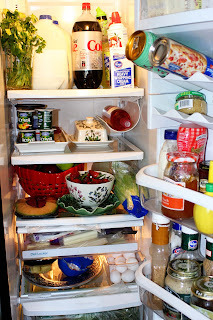 I have been wanting to write a post to our refrigerators. An orderly, pretty refrigerator should inspire you to make beautiful dinners. Everytime you open up your fridge, you should not cringe. 1. Put herbs in pretty glasses. Think of it as flowers for your fridge. A bunch of parsley can be 75 cents. If you don't use it to cook with, at least garnish your plate with it. 2. Straighten out your fridge. Clean it and put things where they belong. 3. 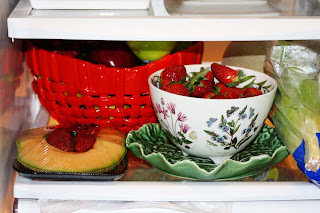 Pull out your pretty dishes and fill with fruit or veggies. 4. 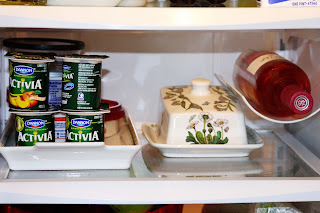 Use serving pieces to organize smaller items in the fridge. Chill a bottle of wine for unexpected guests or a special occasion . 5. This meat plate can be either chilled or warmed to serve items on it. I forget to use it. By having it chilled at the ready, I can use it for fresh veggies or salads. 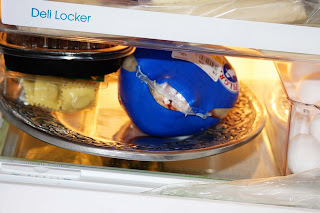 If you want to use it to keep food warm, remove it from the fridge, and bring to room temperature. By having it in your fridge, it will encourage you to use it. My refrigerator is like a pretty room. I smile when the door is open.